of circular form, the domed cover decorated with a blossoming prunus branch and a crescent moon cut through the glaze, the exposed porcelain fired to an attractive pale reddish tone and showing a dry texture in contrast with the glossy surface of the finely crackled ivory-white tinted glaze, with an oblique line cut across the rims to show the correct alignment of top and bottom, the moulded ring foot and lower half of the base left unglazed, but covered with a thin white slip. A similar box from the Collection of Mr. and Mrs. Myron S. Falk, Jr. was exhibited at the Cleveland Museum of Art and published by Lee and Ho in the catalogue entitled Chinese Art Under the Mongols: The Yuan Dynasty (1279-1368), Cleveland, 1968, no. 97, and the same box was shown again at the Yale University Art Gallery and published by Bickford in the catalogue entitled Bones of Jade, Soul of Ice: The Flowering Plum in Chinese Art, New Haven, 1985, no. 62. A smaller box of the same type and pattern, from the Collection of Mr. and Mrs. Eugene Bernat was published by Medley in Yuan Porcelain and Stoneware, pl. 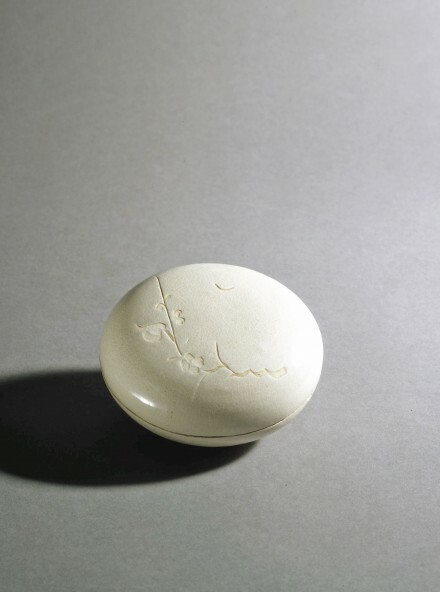 111 B and C, and the author notes a report on pieces of this type, from a tomb near Nanjing dated to the Southern Song by numismatic evidence, including a similar cut-glaze decorated box illustrated in Kaogu, 1958, No. 12, p. 35. Compare also the example of the smaller size illustrated by Gyllensvard in Chinese Ceramics in the Carl Kempe Collection, Stockholm, 1964, p. 157, no. 503. Another example is illustrated by Krahl in Chinese Ceramics from the Meiyintang Collection, Vol. I, London, 1994, p. 279, no. 517, where the author mentions a fragmentary box of this type excavated from a tomb in Ruichang county, Jiangxi province dated to A.D. 1261, illustrated in Jiangxi Wenwu, 1989, no. 2, p. 39, fig. 1.